In the Philippine setting, graffiti is still traditionally seen as vandalism, where public property is defaced by random scribbles written by juvenile delinquents or, by protesters writing their political slogans. There are already some instances where companies hire artists to create murals on their buildings’ walls and the walkways of Makati City feature different artistic styles, but graffiti as street art is still a small movement in the country. In contrast, Europe has embraced street art as a medium of expression on a large scale. As Germany celebrates the fall of the Berlin Wall today, one would marvel at the transformation it has undergone from being a physical and emotional barrier between a divided country to become a symbol of unity all over the world. I was only 6 when the wall was torn down, too young to realize the impact of such a global event, but to see the resulting expression of freedom through the art that has been installed through the length of the East Side Gallery is a breathtaking and emotional trip through that momentous event. The remnants of the wall have become a gallery, where people can gather and appreciate the murals that have become symbols of freedom. At 1.3 kilometers of painstakingly-created graffiti, it is a shining example of how art can bring people together. One of the more known works of art posted on the Wall is the "Fraternal Kiss" showing the Socialist Fraternal Kiss between Soviet leader Leonid Brezhnev and East German President Erich Honecker, with the artist Dmitri Vrubel captioning it, “My God Help Me Survive This Deadly Love.” On a more empowering note is Danke, Andrej Sacharow, an arresting portrait of a Soviet nuclear physicist, dissident, and human rights activist who stood for freedom and liberty, also by Vrubel and Viktoria Timofeeva. Cartoon Heads; Berlin | Photo: © Jeffrey Hernaez In contrast to the solemnity of the two other works, Cartoon Heads by French artist Thierry Noir, who is said to make it his mission to “demystify the wall” as his revolutionary act, with his brightly colored exaggerated heads doing just that – transforming the edifice by lending a bit of levity to something so awful. Perhaps the most succinct instalment on the Wall is It’s Happened in November by Berlin artists Kani Avi. 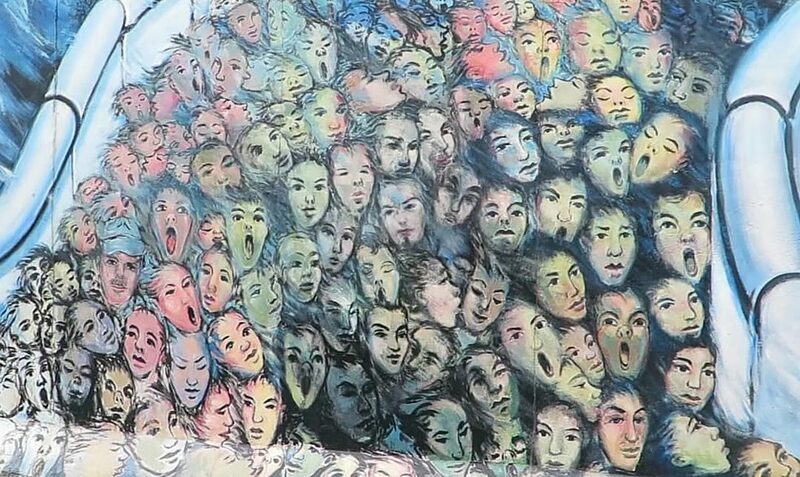 It is an abstract that depicts the gamut of emotions from East German faces as they cross into West Germany after the Wall fell. Checkpoint Charlie, as shown in the painting was a myriad of faces full of hope – or uncertainty as they crossed over to the free world. It's happened in November; Berlin | Photo: © Jeffrey Hernaez If the Berlin Wall was built to divide two different ideologies (East and West Berlin), now the remnants of the wall are now covered with graffiti that challenges norms, ideas, and unites not only Germany, but the rest of the world that is still currently struggling towards integration and lasting peace. It shows that something physical like the Wall, which was built to divide people can now be seen as a canvas for expression, where graffiti and other forms of modern art -- even those that are posted online – are just as effective in portraying emotions and movements as those that were created by the Masters. Jeffrey Hernaez from Manila is an exchange journalist at Märkische Oderzeitung for three weeks in Berlin. The article “Street Art as an Expression of Freedom” was published by MOZ.de on October 6th 2018.